THIS TRIP IS SOLD OUT. THANK YOU FOR YOUR SUPPORT! Leave the driving (and parking) to us! The Alexander Hamilton U.S. 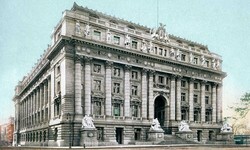 Custom House?home of the George Gustav Heye Center of the?National Museum of the American Indian?is one of the most splendid Beaux Arts buildings in New York. Rich in architectural and historical significance, the Custom House is a National Historic Landmark, listed on the National Register of Historic Places. We will enjoy a docent-led tour of the historic and architectural features of this important building, after which guests will have 40 minutes to explore the Museum of the American Indian.? Then we will walk to Fraunces Tavern for a delicious luncheon. After lunch, guests will have time for either a docent-led or self-guided visit through Fraunces Tavern Museum, a 1719 building filled with a collection devoted to the history of New York's role in Colonial America, the Revolutionary War, and the Early Republic. OR DOWNLOAD, FILL OUT, AND RETURN THE PDF BELOW, WITH PAYMENT, BY JANUARY 27, 2017,?TO:? Cancellation policy:?Space on this bus trip is very limited. Refunds will be given?only?if your space can be filled by another guest prior to the trip. A waiting list will be compiled, and available spaces will be filled on a first come, first served basis. Only those who have made full payment can be accommodated.